One of the biggest buzz words on the Internet today is "Ubuntu" (pronounced "oo-Boon-too"). Ubuntu is a Zulu word that means respect one's community. Ubuntu is also the fastest growing Linux distribution on the planet. In this article, I answer the following questions: Why is Ubunto so popular? Is it really that much better than any other Linux? Is Ubunto a threat to Microsoft Windows? And how difficult is it to try Ubunto? Ubunto is a Linux "distribution". Linux distributions take the Linux "Kernel", (the heart of the Linux operating system), and add applications, system administration utilities, and an installation program. Some Linux distributions include too little. You might be able to boot them from a floppy disk, but you can't do anything with them. Most Linux distributions provide too much, requiring multiple CDs or a DVD. 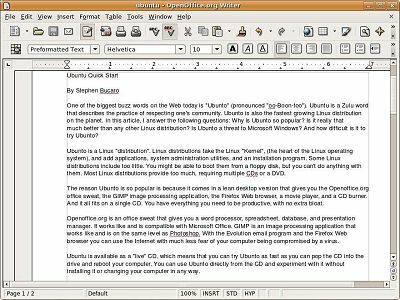 The reason Ubunto is so popular is because it comes in a lean desktop distribution that gives you the Openoffice.org office suite, the GIMP image processing application, the Firefox Web browser, a movie player, and a CD burner. And it all fits on a single CD. You have everything you need to be productive, with no extra bloat. Openoffice.org is an office suite that gives you a word processor, spreadsheet, database, and presentation manager. It works like and is compatible with Microsoft Office. GIMP is an image processing application that works like and is on the same level as Photoshop. With the Evolution email program and the Firefox Web browser you can use Ubunto on the Internet. Ubuntu is available as a "live" CD, which means that you can try Ubunto as easy as you can pop the CD into the drive and reboot your computer. You can use Ubunto directly from the CD and experiment with it without installing it or changing your computer in any way. One way you can get Ubunto is to download it from the Ubunto Web Site, but the file size is 700 MB, that takes several hours even with a high-speed Internet connection. Then you have to burn a CD with .iso format. The book shown here includes a Ubunto live CD.